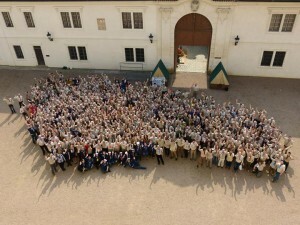 (Litomyšl/Junák) – A new name, a new constitution, a new national leadership, registration of boy AND girls and men AND women with the World Organisation of the Scout Movement (WOSM), and work on Junák’s new Strategy 2022: more than 450 delegates representing 50000 Scouts and Guides in local groups all over the Czech Republic can be proud of what they achieved during the three-day General Assembly of their association, which took place in Litomyšl in eastern Bohemia over the last weekend in March 2014. The halls and grounds of the renaissance-period castle in Litomyšl (a UNESCO heritage site and European YMCA Training Centre), was the beautiful and inspiring setting for this meeting. Milena Pecarski, Pascale Vandersmissen and Nicola Grinstead, respectively, represented the European Scout Committee (WOSM), the Europe Committee of the World Association of Girl Guides and Girls Scouts (WAGGGS) and the World Board WAGGGS and were international witnesses when the delegates discussed and later approved a number of historic decisions, which will mark the next couple of years in Junák, the National Scout Organisation (NSO) of WOSM in the Czech Republic. They were particularly welcome resource persons when the assembly reviewed main arguments in favour or against Junák no longer registering its female members with WAGGGS. Civil servants and politicians also attended the meeting and reflected the recognition by local and national authorities of Junák’s valuable work in the area of non-formal education for the benefit of children and young people across the country. The adoption of the new Constitution of Junák was one of the most important decisions by the General Assembly. The change had been necessary following the introduction of a new Civil Code in the Czech Republic at the beginning of 2014. Pursuant to provisions in the new Civil Code the assembly had to amend the association’s official name. 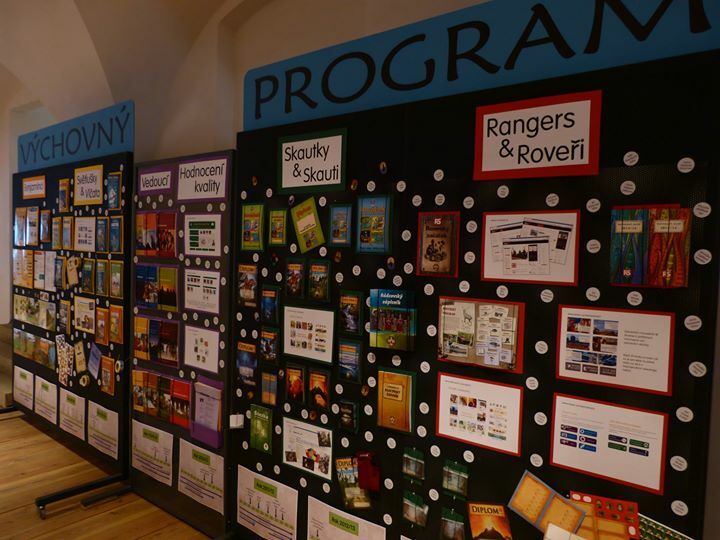 The delegates opted for the name under which Junák had already been known a hundred years earlier, when Scouting had first started in the then Kingdom of Bohemia: Junák – český skaut, z.s (in English: Junák – Czech Scouting, in French: Junák – Scoutisme tchèque). For practical reasons, the new name will only come into force later in 2014, following a decision by the National Board. 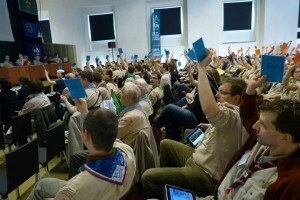 The second main decision concerned the question, whether Junák should continue to register its female members with WAGGGS. The National Board and Executive Council of the association had initially proposed to register all members with WOSM only and to leave WAGGGS, mainly because of the growing differences between the missions and strategic directions taken by Junák and WAGGGS. 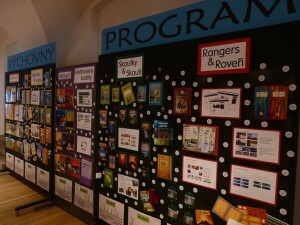 However, following an open and critical consultation process that had involved all levels of the association, further discussions showed the importance of WAGGGS for many members of Junák, with the main argument being the continued wish to express solidarity with Girl Guides and Girl Scouts in other parts of the world and to support the important work WAGGGS does in the developing countries around the world. The latter arguments had convinced the National Board and Executive Committee to review its original proposal and to suggest the so-called Half-Super-SAGNO-Model instead. When the question was put to vote, the majority of the assembly was in favour of this model, which means that Junák will henceforth register all its members, boys and girls and men and women, with WOSM, while continuing to register its female members with WAGGGS. This will on the one hand allow Junák to get all its members fully involved in all areas of WOSM, including the governance levels, world and regional activities as well as projects and missions, which were similar to Junák’s own mission, and on the other hand to maintain female membership with WAGGGS and thus underlining Junák’s continued support of that association’s effort in the advocacy for the rights of girls and women worldwide. The General Assembly also discussed Junák’s strategy towards 2022 and approved the work achieved so far. The new strategy will eventually enable Junák to become an even more active member of the Czech civil society and offer better Scouting to more young people in the Czech Republic. On the final day of the meeting, the delegates elected the new leadership of Junák, which will accompany the association and provide guidance for Czech Scouting during the next three years. Eva Měřínská and Vendula Bušková, respectively, are the new Chief Guide and Deputy Chief Guide, while Marek Baláš (Chief Scout) and Michal Tarant (Deputy Chief Scout) will both serve their second terms in their positions. New members of the National Board, the Arbitration and Conciliation Board of Junák and Junák’s Central Auditing Commission were also elected. The (appointed) Executive Committee led by the Junák’s President Josef “José” Výprachtický stays in office. 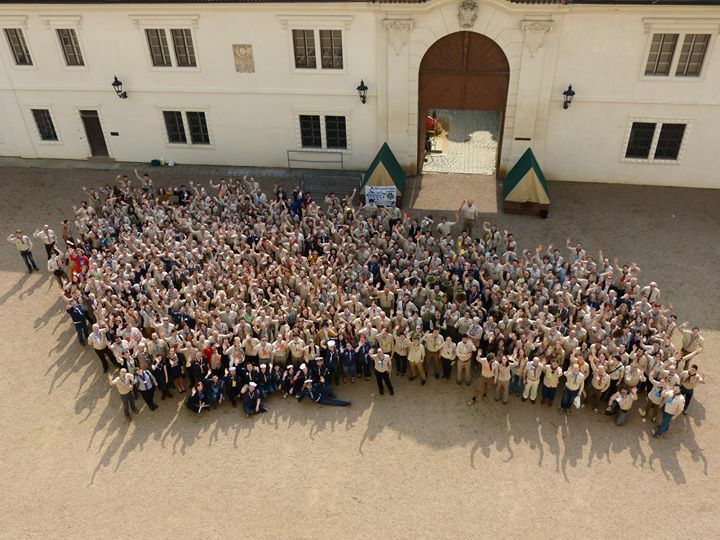 Many tired but happily smiling Scout and Guide Leaders were seen leaving the beautiful grounds of the castle in Litomyšl on Sunday evening, returning to their Scout Regions and local Scout and Guide Groups to begin implementing what they had agreed at Junák’s General Assembly 2014.